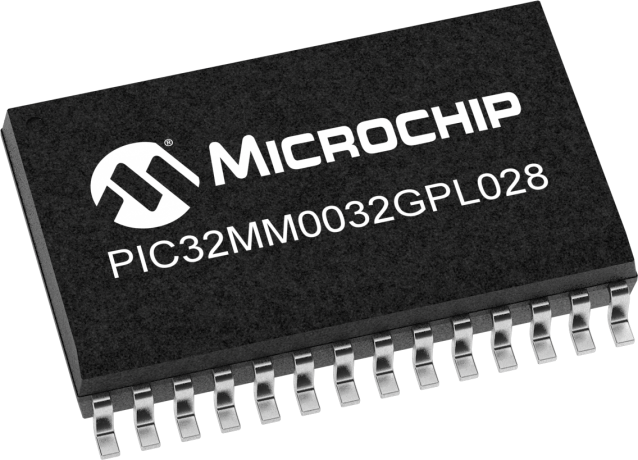 The PIC32MM family is Microchip's lowest power and most cost-effective family of 32-bit PIC32 microcontrollers. For applications demanding low power, longer battery life and space constraints, the PIC32MM devices offer sleep modes down to 500 nA and packages as small as 4 × 4 mm. This family features core independent peripherals, designed to offload the CPU, such as Configurable Logic Cells (CLC) and Multiple-output Capture Compare PWMs (MCCPs) which help enable sensorless BLDC motor control applications. The PIC32MM devices achieve a 79 CoreMark™ score at 25 MHz operation, featuring the compact microMIPS™ instructions, microAptiv™ UC core and a shadow register set for fast interrupt context switching. The microMIPS ISA combines 16-bit and 32-bit instructions for compact code size. The PIC32MM devices are supported by Microchip’s MPLAB® Code Configurator (MCC) to help simplify designs. Target applications include IoT sensor nodes, connected thermostats, environmental monitoring devices, portable medical or fitness devices, building automation and low cost motor control applications. PIC32MM0064GPL036 General Purpose PIM is designed to plug into the Explorer 16 or Explorer 16/32 Development Boards and demonstrates the capabilities of the PIC32MM “GPL” family of low-power and low-cost devices.